For years, grassroots activists from all across New York state have fought for meaningful voting reforms. In January, following the historic 2018 midterm elections, the Let NY Vote! 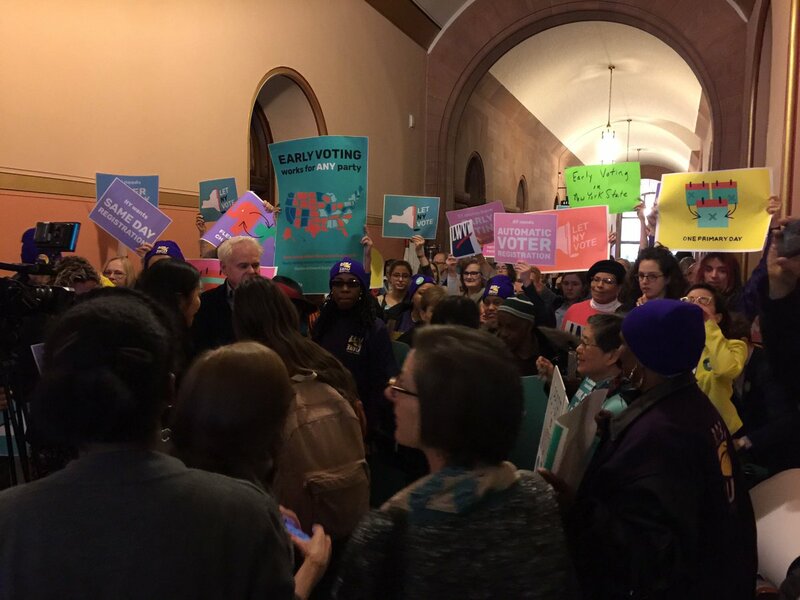 Coalition successfully passed the first major voting reforms in New York in more than 100 years! Write a Valentine's Day Card to Governor Cuomo: Governor Cuomo has until next Thursday, February 14 to amend his budget to include needed funding for Early Voting to succeed in New York. Write Governor Cuomo a card today and let him know that you expect him to fund Early Voting in his budget Amendments. Click here. Promote the Feb. 12 Mobilization and Lobby Day in Albany: Lift up the action on social media and send an email to your NY lists to invite them to join! You can find promotional materials in this google doc. Join the Fair Elections Petition list swap: Share this petition with your members to support Fair Elections in NY (click here for sample email). Contact Laura Friedenbach (lfriedenbach@fairelectionsny.org) to participate in the list swap. Participate in upcoming events with Let NY Vote: Join many of the DI's partners and coalition allies for events and mobilizations, including Common Cause NY, Jamaica NAACP, League of Women Voters Buffalo, and more! Event schedule can be found here. The people of Maryland overwhelmingly voted Yes on Question 2 last November, one of the campaigns the DI and our coalition allies supported to institute Election Day Registration statewide. Now, the Maryland Legislature has introduced the EDR legislation, and is holding their first hearing February 12. We need show our collective power to ensure EDR gets implemented. The Everyone Votes MD coalition is putting together testimony for the hearing, including testimony specific to your organization. Allies are also welcome to join Common Cause Maryland for verbal testimony at the hearing. Also, the Maryland Senate's Education, Health, and Environmental Affairs Committee is holding a hearing on February 14 about an Article V Convention, one of the gravest threats to our democracy today. Common Cause Maryland is heading up testimony against the Article V Convention, and is looking for groups to provide additional testimony and support to kill this resolution. For more information on either or both hearings, and to get plugged in, email Damon at DEffingham@commoncause.org. On Monday, February 4, Civic Nebraska kicked off its new campaign to restore the ability to vote for returning citizens. Civic Nebraska is looking for social media amplification to get the message out, even from out-of-state groups. It's clear that demand for ending felon disenfranchisement is growing at the state level across the country! Here's a link to their Facebook post, YouTube video, and blog post. Share widely! 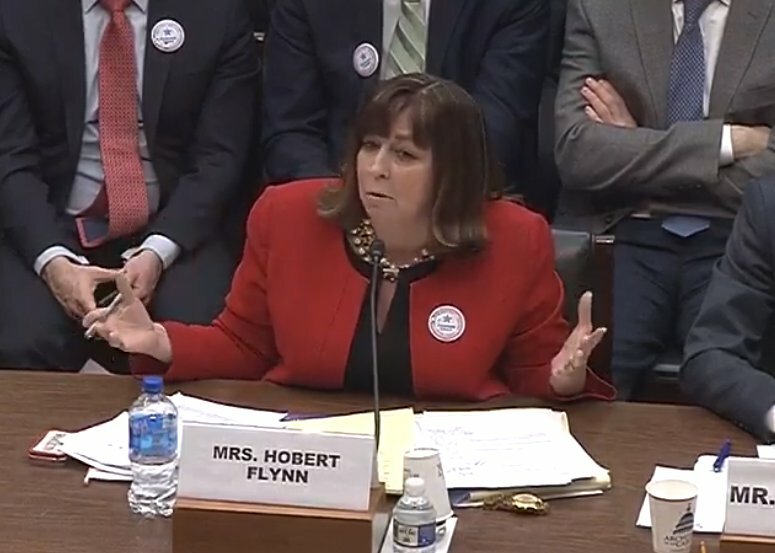 DI Board Co-Chair and Common Cause President Karen Hobert Flynn testified on Thursday before the House Committee for Oversight and Reform on the Ethics components of HR 1, the House Democrat's legislative package of democracy reforms. "Americans have not been waiting for Washington to fix what ails them in our democracy. We've been working at the state and local level, with many other groups, to pass significant pro-democracy reforms. This is the second consecutive election cycle where voters have passed 95% of the democracy reforms on the ballot. In 2018, voters in 20 red, blue, and purple states and localities have passed democracy reforms with strong support from Republican, Independent, and Democratic voters." A short clip of an exchange between Hobert Flynn and Rep. Ocasio-Cortez went viral on twitter, demonstrating the clear and growing support for ethics reform among everyday Americans tired of corporate interests hijacking our democracy. A longer version of the clip can be found below. The entire hearing can be viewed here.